Gail L. Jenner is the wife of a fourth-generation cattle rancher. They have three married children and eight grandchildren and live on the original family homestead, where history is part of everyday life. 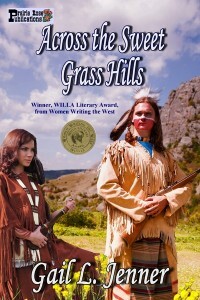 A former history and English teacher, Gail is the author of five nonfiction titles and two novels, including the WILLA Award-winning novel Across the Sweet Grass Hills. Gail writes for NPR/Jefferson Public Radio’s historical series and appeared in 2011 on History Channel’s How the States Got their Shapes. Her work has appeared in magazines and she has placed in a number of competitions, including the William Faulkner Short Story Contest, the Jack London Novel Contest, two Writer’s Digest competitions, and several screenplay contests. Although it didn’t feel adventurous to me then, because I was so madly in love and I was only 20, marrying a cowboy/rancher and moving to a remote rural area was probably pretty adventurous. Many of my friends at the time thought I was crazy. Our house was an 1860s farmhouse that had not been remodeled since the 1920s – but I thought it so romantic, nothing deterred me! Traveling to more places with my husband, including Alaska and parts of Canada and the U.S. that I haven’t seen – places where we can camp and explore and take horses. I’ve traveled to a number of places, but generally without my husband! I’ve been a fan of Debbie Macomber and Jane Kirkpatrick and also Vella Munn and Cindy Leal Massey. Mostly, I love powerful, historical novels like The Help, Sarah's Key, and Widow of the South. I used to read a lot of Catherine Coulter and Nora Roberts, and I often return to the classics, including Jane Austen and Willa Cather. I’ve begun reading several Prairie Rose authors since joining their publishing community, including Cheryl Pierson and Livia Washburn, and I’m excited to read more! Typically, I look for strong characters and a strong story, and for me, historicals are a plus. I believe color says something about a person’s personality. What’s your favorite color? I am fickle, but I tend to lean toward blues and pinks, but I love combinations of colors, like blue and yellow. In my house, I tend to neutrals because I’m slow to change décor and color schemes, so I find neutrals soothing. In clothes, I’ve been told I look great in blue, lavender, pink, and some shades of green. I would pay more attention to the details in life – at an earlier age! I would sit for longer stretches with the oldsters in my family and listen to their stories and wisdom about life more closely – take down stories and write the names of people on old photos. I would pay better attention to people in general. What would I do again? Everything I’ve done! What is your writing process from conception to finished MS? I started out as a "panster" and then moved to be more of a plotter. I like having a strong sense of my character before starting. Character for me is much more important than plot – or, rather, my plot and conflict originates with my characters and what I hope they learn or experience as they move through the story. I want them to overcome, to succeed – even if they fail at something – but the emphasis is on character arc and development/change. That said, I begin with strong character charts and throw flaws or issues into their lives, all the time doing research into the history of time and place that provides the backdrop. The process for me tends to be cyclical, as characters, research, conflict weave me back to the beginning or plunge me further ahead. I go back a lot in the beginning then I find my “plane” and push on. The conclusion usually slows me down as I throw out situations or details that take me off my path. As I stated, I started out as a full-fledged panster, but that led to too many delays and rabbit trails, so I am now both. I start strong and then let the characters dictate our journey. I do struggle to maintain a plan as the story evolves, but I’m always keeping the end in front of me. For my two published novels, both involved a lot of historical research, especially primary documents and visiting locations/sites of importance. I did an excessive amount of reading, research, etc. For Across the Sweet Grass Hills, a story that was centered around Baker’s Massacre and the Blackfeet, I traveled to Montana with my sister, my mother, and four of our children – in an old 1969 pickup truck with old camper! It was an adventure all by itself. For the nonfiction books I’ve coauthored, I did a lot of research into archives and interviewed a number of old storytellers and local historians. I think I never tire of watching Pride and Prejudice or Tombstone, and I’ve watched Lonesome Dove dozens of times. I love The Patriot, although sometimes it’s just too sad. I’m a fan of romantic comedies like While You Were Sleeping and Bridget Jones or The Holiday. Recent movies I’ve loved include Heathens & Thieves and the adaptation of The Help. TV shows include HGTV and Food Network, along with History Channel specials, and series like Downton Abbey. How important do you feel writing workshops are to any writer? Incredibly important! Can’t emphasize enough what I’ve learned and gained through workshops, courses (online or in person), and conferences. The networking, the new ideas, and re-invigoration that results is immeasurable. I’ve saved myself an incredible about of time and I’ve met editors, agents, and other authors who have been either an inspiration or have offered me writing jobs! To become an accomplished Natural Horsemanship trainer! I have been working with a few young horses over the years, but the process is so much more than what I’ve done and it takes TIME, TIME, and TIME to really see results and develop the confidence I hope to have someday! And along with that, I’d love to race barrels! If you had a million dollars to donate to any one charity, what would it be? Hand of Hope or another Christian charity that helps those in desperate places in concrete ways, eg: building water systems, improving agriculture. Or to the Cystic Fibrosis Foundation because a dear friend of ours has gone through so much trying to build the strength of their 18-month-old daughter. CF does not get the kind of funding that cancer research or diabetes foundations get and the disease is so frightening and life-curtailing, it needs more support. What advice would you like to give to an aspiring writer? KEEP WRITING. The real difference between a published author and an aspiring author is a completed manuscript! Put that way, the task of finishing is the most important step in getting published. Of course, editing and revising are part of those necessary evils that take a completed ms. out of the slush pile, but the story must be FINISHED first! Did anyone mentor you or help you along the way? Please tell us about your mentor and what you feel they contributed to your writing career. I did not have any single mentor, but the writers I met through critique groups and writing groups filled those roles. And I read every Writer's Digest I could get my hands on and bought writing books by the bucket load – also attended a number of courses early on. I have since mentored other younger or newer writers, and as an English teacher, I have spent my career writing or critiquing others. But I started as a young girl and have never stopped writing…never! In that vein, the encouragement I got at that early age was from my family and my teachers who saw in me the drive to write. #1: Keep writing! #2: Plaster your walls with every rejection slip you get; by the time you reach 100, or 1000, you will have also sold something! The message: Do not give up and do not get discouraged. Failure only leads to success, if you are ready to keep moving forward. Right here, on our fifth-generation cattle ranch, overlooking nearly 3,000 acres of ranchland, with a slough rich in wildlife and surrounded by mountains outside my window. Our valley has been called Shangri-la – and that’s what it represents to me still, even after almost 43 years. Upstairs in our “office/hobby room,” overlooking our ¼-acre garden area, with the mountains (often snow-peaked) beyond the ranch that surrounds me. Sometimes I sit in the bay window of our living room that sits on the opposite side of our farmhouse and peer out in a south-westerly direction. From that window, I look out on the hundreds of head of cattle that we run and more mountains. I generally write a portion of every day. If not writing, then I’m editing or researching. Or I’m marketing. On the ranch, however, my days are erratic and I’ve given up closing the door to family and ranching issues; that only leads to frustration and confusion. But my mind is almost always occupied by my WIP or by questions/concerns about writing. I have learned to take notebook/pen with me so that no matter where I’m at, I have some kind of tool with me! What is a genre that you have not attempted that you would like to try? I’m pretty eclectic and diverse at this point in my writing. I have written and sold two novels, 6 nonfiction books, and a number of feature/profiles and articles, short stories, recipes, poetry and children’s stories. I have not sold, but have written and placed in a number of script-writing contests. The one genre of novel writing I have not done that I’d like to do, though, is contemporary romance (my novels are historical). My second novel was a YA and I’d like to pursue more YA stories or perhaps try this “New Adult” genre, too. Is there anything you would like readers to know about you? I love the fact that writing fiction – though some consider it “not real” – is, in my mind, a powerful tool for delving into the human heart and our common human struggles. I think authors and writers have a unique opportunity to influence others in positive ways and are vehicles for connecting us or re-connecting us. Story is a basic fundamental activity of all humans. My college degree was in Anthropology and English and I realized early on that story and the story form (whether oral or written) is essential to human interaction and development. I believe in that regard, we have a powerful “weapon” in our hands! Never think of writing as a secondary kind of career choice. Find out more about Gail on her website.